4.0 out of 5 starsAre we really Alone! What a great story. Me a cat lover knew they are a special creature. Guardian angels must real. This is must read. Great story ,I enjoyed this book. Good story. Very Believable. Didn't want to put it down. I will look forward to the next book by this author. 5.0 out of 5 starsDon't believe the bad reviews! Wow. Someone said this was amateur? I'm an author and editor, and I can tell you this is a 5 star effort. Yes, the ending needs a bit of an "afterward, showing Tess settling in to her new circumstances. This would definitely give readers a sense of conclusion, but come on folks, the unanswered questions aren't really unanswered. The clues are all there. Use your brains. Tess figured it out, so can you. I could use a sequel, mainly because I would like to read more of this world she is going to be living in, and how things are going to progress. But all in all, I'd recommend this to anyone who enjoys disaster fiction. Tess is left in an underground bunker when the apocalypse happens. Why? Because her father is the prepper and he is going go get Tess's older brother and come right back. He doesn't come right back. In fact he doesn't come back after two months and finally Tess is forced to leave, not knowing what she will find outside. Oh, did I mention she has a cat? Not a dog, which could be helpful and a good companion and protector, but a cat. Yeah, I'm not a fan. So begin the adventures of Tess. We are not totally sure what all has happened, but it is something nuclear at least. She is on a mission to find her father and brother if they are still alive. She comes across a young man named Cole who is alone too and we think about twenty four. He is fun, free spirited and for some reason puts up with the very annoying spoiled brat sounding Tess. No, didn't like her much at all. Very immature, very unprepared for being on her own and very unwilling to admit her own vulnerabilities, of which she has many. She turns seventeen in the bunker so as we move along in the story we are seriously hoping she matures. It is told from her point of view so we have to listen to all her fear, defensiveness and fear...of everything. Thing start to get very confusing between Tess and Cole, and I am referring to much more than any romantic spark that begins between them. Events happen that are not clear what they mean. I am dying to find out, and the way the story was left nothing was clear at all, in fact more curious than before. And it did just end. Yes, it is a series, a trilogy, the author informed me when I asked, and it was written a year ago with no book two out yet so I hesitated starting it until I knew for sure the next one was coming soon. The author said it will be released "soon." So I read this book and now I really want to continue with the story. It is well written and although I don't like the heroine much at all she has room to grow and she does. I almost gave this book five stars but the ending left the reader, me, in the lurch and all those other readers who read it when it first came out. I'm sure the author has some explanation for the cliff we are left hanging on, but can we please have a hand off this cliff really really soon? Also I am not sure a father would leave this particular stubborn, impulsive, fearfull daughter in a bunker alone to go fetch his older son. Nor would he send rescuers to get her without giving them the code so she would let them in. 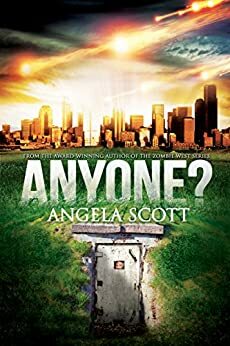 So I love all books I have read by Angela Scott and I am begging her to please give us book two VERY soon. It appears there is a sequel coming in 2016, so hopefully that will wrap things up a bit more, but my 3 star review largely reflects the fact that the book simply felt much too unfinished. Angela Scott is a talented writer and has crafted a very good story in "Anyone? "; but the plot felt too unclear with too many threads left hanging at the end. I hope the sequel will address those and give another taste of Angela Scott's ability to craft an intriguing story. Tess's world comes to a shatter halt when fire suddenly rains down from the sky. Her prepper father hustles her out to their backyard shelter and orders her to lock the door and only unlock it when he returns with her brother. But days and then weeks pass and still her father doesn't return. Finally, Tess decides she must set out after him and begins to make her way across a dystopian, post-apocalyptic landscape in search of her family. It is an entertaining and well-written dystopian fiction, easily would have been 4 stars if it hadn't felt so unfinished at the end. There is so much to love about this novel! First off, I'm a huge sucker for dystopian fiction. Huge. So right off the bat, I loved the premise of this book. Second, I adore Tess and her cat and Cole. They're all so great! The story moved along at a good pace - I was never bored. I never skimmed sections. Really well done in that regard. The things I didn't like as much: This book could use a hard edit. Just to tighten up the writing and make sure all the grammar is correct. And the biggest thing I didn't like was the ending! I felt like the ending wasn't really an ending. If there was a second book, I would have bought it immediately! But there isn't. (At least at the time I read this.) And there was no mention of one at the end either. So I'm left wondering who/what Cole is, what happened to the earth, what's going to happen to everyone, etc. A satisfying ending to a book (in general) doesn't have to tie up every single thing, but it at least has to let you know if the characters are real or just figments of a diseased body/mind, as the author suggests Cole might be! Is he real? Is Tess going to survive? And what actually happened to the world? I needed a little more.